In 2010, the American Planning Association launched a project with nothing less than the future of the planet at stake. The Sustaining Places Initiative looks at how cities, towns, and regions can meet today’s needs without draining the next generation’s resources. 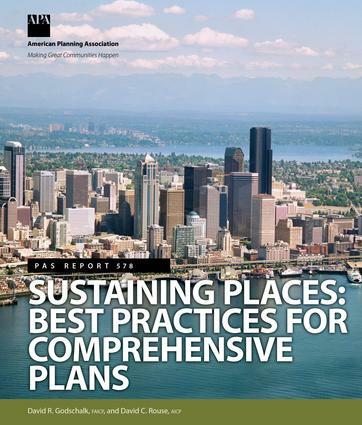 Out of that initiative came Sustaining Places: The Role of the Comprehensive Plan, a 2012 guide that makes the case for building sustainability into long-range planning. Now APA has gone further, explaining how to put those plans in place. Sustaining Places: Best Practices for Comprehensive Plans offers six principles for creating livable, healthy communities in harmony with nature — communities that have resilient economies, social equity, and strong regional ties. Four steps show how to turn those principles into a plan and score the results. Insights from 10 pilot communities add the real-world perspectives of big cities, small towns, and everything in between. This report is not a recipe. It’s a resource with principles, processes, and pointers communities can use to forge their own solutions as they meet the greatest planning challenge of our time. David R. Godschalk, FAICP, is emeritus professor of city and regional planning at the University of North Carolina, as well as an author and occasional consultant on comprehensive plans. His most recent books are Sustainable Development Projects: Integrating Design, Development, and Regulation and The Dynamic Decade: Creating the Sustainable Campus for the University of North Carolina at Chapel Hill, 2001-2011. He led the Sustaining Places Task Force and Plan Standards Working Group. David C. Rouse, AICP, is managing director of research and advisory services for the American Planning Association. In this position, he oversees the Planning Advisory Service and the three National Centers for Planning. Prior to joining APA, he was a principal at WRT, a nationally recognized planning and design firm. He has extensive comprehensive planning experience and served on APA’s Sustaining Places Task Force and Plan Standards Working Group.